This Blog is a digest of a Boston sports fan encompassing the Patriots, Celtics, Red Sox and Boston College Football and Basketball. The Patriots became the 2nd team in NFL history to reach the 14-0 mark matching the 1972 Dolphins perfect regular season (in '72 the Regular Season was only 14 games rather than 16) and wrapped up homefield advantage throughout the playoffs. The Patriots officially are playing for nothing but the W as the results of the remaining two games will have no effect on their post season seeding. I'm conflicted about what to do now. I think that resting most of the key starters would be beneficial in allowing them to heal, rest and prepare for the post season. BUT, there is the possibility that without game conditions they may lose their edge like the Colorado Rockies before the World Series. With the last two weeks of the season and the bye week off this is a serious concern, but the Rockies were young and inexperienced, Tom Brady and the Patriots have been there before and know what it takes to be champions. What would be best? Probably enough playing time to keep the starters sharp, but otherwise rest them. 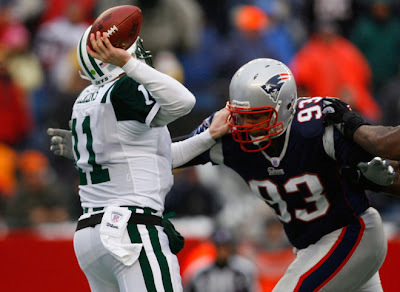 The Patriots beat Mangini and the Jets 20-10. The weather conditions in this game was a huge factor. It had snowed the night before and was still snowing in Boston around game time. The FieldTurf looked excellent, but Tom Brady did not. The wind caused the ball to carry. The wet ball led to dropped and bobbled passes. This was the primary reason for Tom Brady's bad game. Leave it to Laurence Maroney to make me look stupid by putting up a great game right after I got through trashing his season up to this point. I'll forgive him for this one. The reason the Patriots won this game was actually the defense and special teams. Eugene Wilson provided the Patriots with a touchdown by returning an interception for a touchdown on the first drive of the game after Jets QB Kellen Clemens got a good look at the FieldTurf compliments of Patriots DT Richard Seymour. Clemens injured his ribs on that play and would not return. The only offensive touchdown was gift wrapped for them by a blocked punt by Kelley Washington placing them deep in Jets territory. The Jets also had a touchdown compliments of a botched punt attempt as Patriots punter Chris Hanson couldn't get a handle on the football and gave the Jets time to block the punt and return it for a touchdown. Other than that, this game was a showcase of offensive failures. The Patriots had problems moving the ball all game and the Jets squandered multiple trips to the Red Zone as the Patriots defense improved on it's early season failures in the red zone. There was a brief reprieve in the game called after the fans began throwing snowballs at the Jets bench and the camera showed a large chunk of ice thrown onto the field. 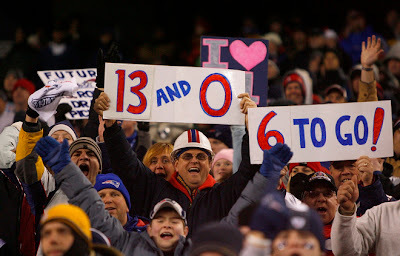 I'm starting to wonder if it's a good thing that the Patriots have homefield advantage throughout the playoffs. It seems that the Patriots lose their explosiveness on offense when the weather conditions get bad. Tom Brady's lackluster games against the Ravens in the Wind Bowl and this so-so game in a messy home game wasn't encouraging. If these conditions had hit when the Patriots were playing a better team than the Ravens or the Jets the quest for 19-0 might be over. I'm not concerned about the remaining games this season. A loss would be bad, but I'd prefer another Super Bowl trophy to a perfect season with a post-season collapse when Tom Brady can't win the game because they're so dependent upon their passing game. Then again, playing in Pittsburgh or Cleveland probably wouldn't be much of an improvement over Foxborough. The Dolphins ended the quest for 0-16 with an overtime win over the Ravens thanks to a botched field goal kick by the Ravens kicker. It might be nice that the Dolphins no longer have that chip on their shoulder when they come into Foxborough next Sunday, or maybe it'll be bad now that they've had a taste of victory and have a chance to break up the perfect season. I suppose only time will tell. The 49ers managed to slip by the Bengals on Saturday night moving the Patriots draft pick down a few spots. The Browns beat the Bills 8-0 in near blizzard conditions. That wasn't a touchdown with a two point conversion either, that's two field goals and a safety. I thought the snow here was bad. The Browns are poised for a playoff spot if they don't screw up the last two weeks. The Jaguars beat the Steelers at home to help set themselves up for the wild card and for being the only team to beat the Steelers at home I'm granting the Jaguars official "Dark Horse" status. The Jaguars are also the only likely playoff contender that the Patriots haven't already beaten and have a solid 10-4 record. Their losses this season include two to the Colts, their opener against the Titans and a loss to the Saints without their starting QB. Carolina upset the Seahawks to ensure a first round bye for the Cowboys in the playoffs. The Colts didn't wow anybody by beating the Raiders by 7 points, but wrapped up their division. Dallas had a terrible game against the Philadelphia Eagles to keep things interesting in the NFC. The Eagles seem to be playing much better down the stretch. They gave the Patriots a run for their money and were the only team besides the Patriots to close the deal against Dallas this season. The Chargers wrapped up the AFC West with a big 51-14 win over the Detriot Lions. Jon Kitna threw 5 interceptions, hard to win games that way. This is another team that seems to have really gotten it's act together down the stretch. This is another team I wouldn't mind avoiding in the playoffs. The Redskins beat up on the Giants in New York to keep their playoff hopes alive. Hopefully this is an indicator of how the Giants plan to play for the remainder of the season. The Mitchell report, an investigation into steroid use in Major League Baseball, was released to the public today and showed some interesting findings. Initial reports suggested that Red Sox catcher Jason Varitek had been involved with some sort of banned substance, but these reports turned out to be premature. Needless to say this gave me a scare. There's a short list of names that it would have devastated me to hear they were using PED's and Jason Varitek is on it. Partially because Varitek is such a fan favorite and such a long time red sox, but also because I have always considered 'tek to be a mediocre hitter at best and his contributions to be veteran leadership and the work he does with the pitching staff. His offensive contributions are of minimal importance when compared to most of the other bats in the lineup. The biggest blow in the Mitchell report for me was Mo Vaughn. Mo spent years as the face of the Red Sox and became an extremely popular local figure for his extensive work within the community, it's sad to hear that this scandal will tarnish his local legacy both as a good player and a good human being. Eric Gagne was also named by the Mitchell report, but this can be clearly tied to his superlative performance that won him the NL Cy Young award in 2003 and his mediocre performance outside of this season. Thankfully Gagne is no longer our problem and can enjoy falling into obscurity with the Brewers. Brendan Donnelly was also a short term fixture in the bullpen who was named by the Mitchell report, but when Gagne was acquired it was released that Donnelly was hurt and would spend the rest of the season on the DL after undergoing surgery. There was some buzz about resigning him, but this will now likely fall by the wayside if it hasn't already. No other recent Red Sox of relevance were named by the Mitchell report. There were, however, plenty of Yankees on the list. The headliner of this report was none other than the Rocket himself, Roger Clemens. ESPN broke the news that he would be on the list prior to the actual release of the report and this turned out to be more reliable than the information regarding Jason Varitek. This information has permanently tarnished the name of Roger Clemens and taken him down off of his untouchable pedestal with all his Cy Young awards and other accolades. This also may have redeemed Dan Duquette, the man who chose to let Roger Clemens leave Boston because the Rocket was supposedly in the twilight of his career. In retrospect, perhaps the duke was right, maybe Roger was on his last legs and resorted to some desperate measures to get his edge back. Roger has claimed that this is a complete falsehood through his lawyer, but in all honesty the pieces all seem to fit. His bounce back after leaving for Toronto? His late career renaissance with the Yankees? Rogers friend and current Yankee pitcher Andy Petite was also named in the Mitchell Report, along with Jason Giambi, Gary Sheffield, etc. I suppose I couldn't have asked for this report to turn out better. None of those who have received god-like status in this town have been implicated. The Red Sox that were implicated were either long retired, long out of town or never truly worked into the fold here to begin with. But even with that, I can recognize that this is a sad day for baseball and I get no joy from reveling in what is most likely the worst day of Roger Clemens' career. This was the last true hurdle. The Steelers are the last team on the schedule with the talent to legitimately beat the Patriots. The Jets and Dolphins are outclassed by the Patriots in every aspect of the game, the Giants are outclassed as well, but to a lesser degree. I don't think these games are a forgone conclusion, not because of the talent of these teams, but because all the Patriots need is one win (or one Colts loss) in the remaining 3 games to clinch the 1st seed in the AFC. The games against the Ravens and Eagles showed the Patriots can be lulled asleep by terrible teams and rest on their impressive W-L record. The competition doesn't get much worse with the Jets in a tie for the second worst record in the NFL and Miami having the worst record in the NFL. As I said earlier, it may actually be more beneficial to the Patriots to lose these games so that the 3-10 49ers can move under them in the standings and get the Patriots a higher draft pick. Their opponents on the other hand have every reason to win. The Jets got embarrassed at home in the opening game of the year with the Patriots in which the SpyGate/CameraGate incident occurred. Jets fans hate the Patriots for this and if the Jets can break up 19-0 in Foxboro this could make an otherwise atrocious season a bit more bearable and possibly buy Eric Mangini another year at the helm. If the Dolphins break up 19-0 it could be one of the biggest upsets of all time. Think about it. The race for 19-0 and 0-16 ending at the same time with two weeks left in the season? The NFL couldn't write a better script than that. If that's not the perfect storm for a big upset, then I don't know what is. On to the game itself. There were signs that this one could be the end of the line for the Patriots perfect season. Cracks in the armor had begun to show for the Patriots against the Eagles and Ravens with the "only lose by a field goal" blueprint. Perhaps a better team, such as the Steelers, could upgrade the plan to "Don't lose to the Patriots". But as I predicted, the Patriots were going to wake up for this game because they recognized the Steelers as one of the most talented teams in football. The Numbers are somewhat deceiving for the Steelers. Ben Roethlisberger had a downright respectable day behind center with 19/32 and 187 yards. Steelers RB Willie Parker also had what may have been his best game of the season putting up 124 yards on 21 carries. It is somewhat telling however that both of these solid performances only yielded on touchdown. But this doesn't really explain why the Steelers lost, the Patriots offense does. Without strong winds messing with his passes, Tom Brady got right back to business as usual. His 32/46, 399 yard, 4 TD day had Brady back to "video game on easy mode" form. This game was all Brady as the Patriots only had nine carries this game, one being a 4-yard run by Brady. Laurence Maroney couldn't capitalize on Brady's fireworks drawing defenders out of the box with a pathetic 18 yards on 8 carries. While we're on Maroney, I'd like to point out how this guy's terrible season is being swept under the rug while everybody is distracted by Tom Brady and Randy Moss. I often feel that a RB's numbers have as much to do with his talent as it does with the threat of the passing game he's working with. I consider Joseph Addai a heavily overrated RB because he reaps the benefits of Peyton Manning drawing defenders back into coverage and away from the line of scrimmage. Laurence Maroney enjoys a similar benefit, but seems completely unable to capitalize on it. He's 23rd in the league in avg yards/carry and 31st in yards/game. Sammy Morris is 14th and 24th in those categories respectively. This is why I think the Patriots should consider taking Arkansas' Darren McFadden should he be available to them in the draft rather than trading down their pick as they have often done in the past. This win was a flat out beating. The Patriots resolved to beat the Steelers through the air and the Steelers linemen couldn't properly pressure Brady and the Steelers secondary couldn't cover well enough to stop them. Simple as that. I really REALLY hate the bowl system in college football. I hate the questions it leaves unanswered. Sure, we've crowned a national champion, but there are always questions about the participants and somebody getting screwed etc. I hate the subjectivity of non-automatic bids. This might be my bias from going to BC. BC currently possesses the country's longest bowl winning streak. Do you know why that is? Because it's the same story every year. BC falls just short of a BCS bowl and get passed over for worse football teams in the bowl selection process and then plays a team that's beneath them. Why you ask? 3 Reasons. 1) No bowls are held in the New England area because who the hell wants their bowl to take place in frigid New England in the middle of winter when you could have it in somewhere like Florida? 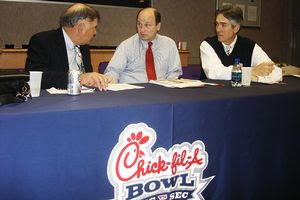 Bowls often like to choose schools that are geographically close to the bowls, like Clemson was for the Chick-Fil-A bowl this year. BC was passed over for this bowl despite winning their division in the ACC, finishing with a better record than Clemson, a higher ranking than Clemson and beating Clemson. 2) BC fans have a reputation for not being willing to travel. Who can blame us for not travelling for this stuff. Who has money for game tickets, plane tickets and hotel rooms or time to do all that for that matter. I love BC football, but I work for my spending money and I live on a tight budget. This is also related to the fact that BC is not near any bowl sites. 3) Sponsors have gigantic boners for programs with more history. Let's face facts, BC's football greatness can be summed up in one pass. More well respected programs like Texas, Nebraska, Ohio State, LSU, Florida, Miami, FSU, Virginia Tech, USC, Notre Dame, etc. always get moved up in the bowl selection process just because they have a dedicated following left over from their national title glory days. "Past success is what makes Stokan's current decision so difficult. With the Hokies winning and claiming an automatic spot in a BCS bowl game, Boston College is probably the most deserving team to invite from the ACC. The Eagles, after all, beat Clemson and Virginia Tech during the regular season and have quarterback Matt Ryan, a Heisman Trophy candidate. But Stokan was noticeably discouraged by the small number of Boston College fans who made the trip to Jacksonville. "We have to protect our ticket," he said." Doesn't that just make you sick to your stomach? It's not about which team was the best, it's about who would sell the most tickets. So here we are folks, the Champs Sports Bowl. BC had this exact same bowl a few years back and won it then. Their opponent? The Michigan State Spartans (7-5 Overall 3-5 Big Ten, placed 8th in the Big Ten conference), this team was barely bowl eligible. So, the Eagles will win and the cycle of mediocrity continues. GO TO A PLAYOFF SYSTEM OR TAKE THE BOWL SELECTIONS OUT OF THE HANDS OF THE SPONSORS NOW!!!! The Ravens were looking like they had slain the Juggernaut, but then they remembered they were the Ravens and played accordingly. The Ravens caught the Patriots napping. With their division already wrapped up and the 1st seed in the playoffs likely to be wrapped up in the coming weeks it's not surprising that the Patriots may not be taking opponents like the Eagles and the Ravens seriously. In a way I think these last two games were the equivalent to the second half slump the Red Sox faced this year. The Red Sox amassed a large lead by the All Star break, coasted through the second half getting enough wins to secure the first seed in the playoffs, and then turned it back on for the playoffs. It might actually be to the Patriots BENEFIT to lose to the Dolphins and the Jets in the hopes that maybe the 49ers will slip under them in the standings and the Patriots will get a higher pick in next year's draft, but somehow I doubt that's what coach Belichick has in mind. 1) The Patriots failure to score in 3 tries on the 1 yard line is the biggest offensive let down this year. When the Ravens were being penalized left and right and they lined up on that one yard line I figured this week we were back to business as usual. All year long they've been getting that hard yard, it's concerning that they didn't this time. 2) Randy Moss was again a non-factor for the second straight game. This is primarily because Moss was being mugged on every snap. Teams have finally figured out that they need to not only double cover Randy Moss, they need to bend the rules. 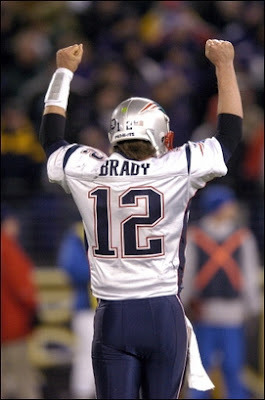 3) The severe winds in Baltimore seemed to seriously effect Tom Brady's ability to throw accurately. There were a number of misthrown and dropped passes. The Ravens had a distinct advantage as their running back Willis McGahee is a much better back than either Laurence Maroney or Kevin Faulk. The Patriots defense looked helpless against McGahee for much of the game, fortunately they were able to stuff him when it counted in the later minutes with the clock winding down. 4) Ravens coach Brian Billick responded to some trash talk from Rodney Harrisson by blowing him kisses....just a little creepy. One of the biggest pitchers on the market at the moment is Twins ace Johan Santana. The man is a bona fide ace who consistently provides a solid ERA and W-L record. He has become discontent with the Twins unwillingness to spend to make the team a contender and as such he's being actively shopped around to the large market powerhouses. The Yankees have made some solid offers of some of their highly touted young talent: Phil Hughes, Ian Kennedy and Melky Cabrera's names have been thrown around quite a bit. Even with Andy Petite on board for another year, the Yankees have some notable gaps in their pitching staff that held them back last year. Santana would solve that problem nicely for the Yankees and make them almost as dangerous pitching as they are hitting with Wang, Petite and Santana in their rotation. Hank Steinbrenner has reportedly set a deadline for negotiating with Santana that has since passed, but this is the same guy who told us that A-Rod was gone and never to return. The Red Sox move some combination of Coco Crisp and one of their top level prospects, either Jacoby Ellsbury or Jon Lester. Ideally the Twins would take Crisp, Lester and some mid-level prospect and the Sox sign Santana for an extended deal. The Red Sox starting Rotation would be undoubtedly the most feared in baseball and strong for years to come. I think it's important to make competitive offers for Santana, but to not completely sell out the farm system in order to get him. Santana is a superb pitcher, but Lester, Bucholz and Ellsbury all have the tools and the drive to become great players. When we traded Hanley Ramirez for Josh Beckett we knew that Ramirez was a future all star, but we got an all star in return. But if we had traded two Hanleys we'd probably all be kicking ourselves.